A wig explained – For the fainthearted . . . The photograph dates from more than fifty years ago, perhaps the spring or summer of 1963. It is taken beside the corrugated iron door of the shed that was used as a garage for cars, the yard being needed to be clear for agricultural vehicles. Half a century later, the garage still stands there, still has corrugated iron doors, and is still used each day. 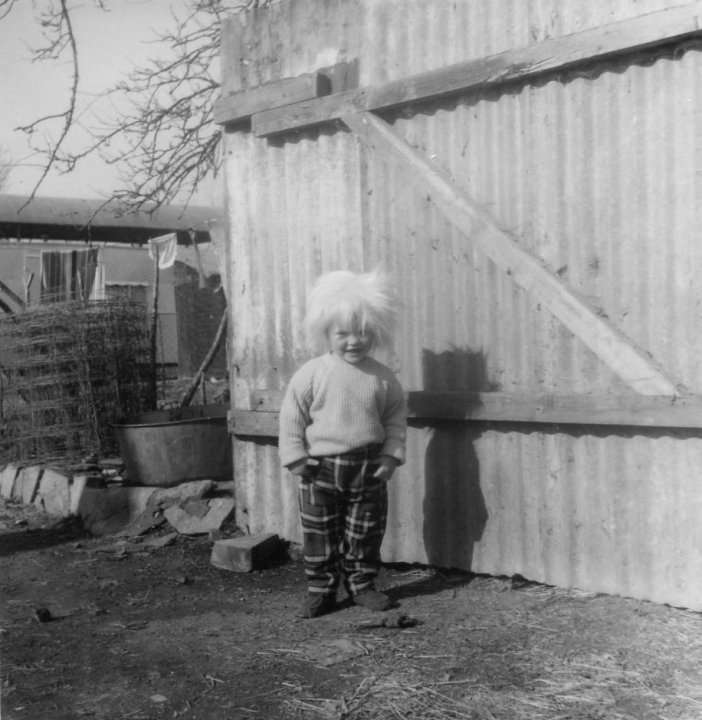 The photograph shows a small boy, two or three years old, dressed in a pullover and tartan trousers and wearing the most outlandish wig, giving him a hairstyle that would compete with that of Albert Einstein on a bad hair day. The wig is hardly something one would expect to find on a small Somerset farm in the early- 1960s. Rural Somerset was nothing if not conservative and there would not have been much demand for wigs, particularly wigs that did not conform with traditional ideas of style and elegance. 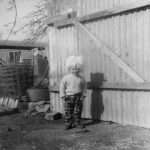 Spiky, blond hair was not something that might have been encountered in the Langport era in 1963. The photograph has been in circulation among members of our family for the past fifty years. The natural inclination of a primary school aged boy upon seeing the picture was to ask from where the wig had come. For five decades, he had been told that it had belonged to an aunt who lived on the home farm. In a county where the arrival of the hippies in the late 1960s had brought an awareness that life could be lived in many and diverse ways and that a blond wig was quite conventional when compared with the garb and hairstyles preferred by the new arrivals in our county. It seemed odd that the aunt concerned would have identified with the hippies, but the photograph seemed proof of hidden radical inclinations. Of course, 1963 was too early for the hippies to have been on the English scene, and who had suggested the wig had anything to do them? A boy had made an assumption on the basis of what he saw around him at the time he was asking questions. Fifty years of imagining her s secret radical gone in a moment, It would cause one to wonder how many more assumptions there are that might be shattered.